Dubai, United Arab Emirates | Feb 5, 2018 – Art Jameel, an independent organisation that supports arts, education and heritage in the Middle East, today announces an international competition, inviting architects and designers to conceptualise a cinema for Hayy: Creative Hub, Jeddah. The competition invites proposals that foreground innovative ideas and creative approaches to the design of an independent picture house in Saudi Arabia. Registration opens today and closes on March 22, 2019. This dynamic competition, a rarity in the Middle East and globally, features a renowned international jury that includes leading architects and cinema specialists. One winner and two runners up will be announced by the jury at the end of the competition in June 2019. Alongside the awarding of the design project itself, this competition programme includes learning opportunities for Saudi-based upcoming architects and designers. A forum series, managed in collaboration with Studio Bound, includes discussion of the shortlisted submissions, and a debate on possibilities, formats and ideas in determining the cinema-going experience. Art Jameel regularly engages in new commissions and awards for artists, designers and architects, including the Jameel Prize, now in its tenth year (held in conjunction with the Victoria & Albert Museum in London), and Art Jameel Commissions, a multi-disciplinary anchor programme of the Jameel Arts Centre, Dubai. 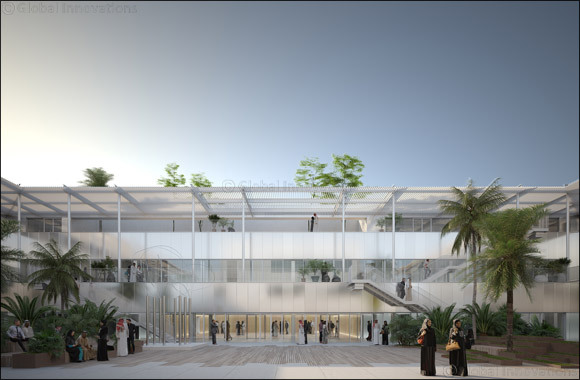 Hayy: Creative Hub is a 17,000-square-metre development; Jeddah’s first bespoke home for the arts and creativity, the multidisciplinary complex is located in the north of the city. Hayy will act as an incubator, bringing together and nurturing artists, playwrights, photographers, filmmakers, entrepreneurs and creatives, along with the enthusiastic audiences that support them. The three-storey complex, conceived by ibda design, offers a contemporary re-interpretation of the traditional courtyard typology, common within the Gulf. The main central courtyard is surrounded by shaded, staggered terraces on the building’s upper levels, which serve as extensions of the courtyard space and allow it to be conceived as a spatial whole that connects every level of the project. On the ground floor, the courtyard is enhanced by seating amongst natural vegetation and greenery. The Hayy: Cinema Design Competition is open to designers registered with architectural or interior design practices, and cinema specialists based in the Middle East, as well as those from around the world regardless of nationality who have links to and a meaningful understanding of the various cultural scenes of the Gulf and the Arab world.